You know about Lewis and Clark the explorers. But are you familiar with Lewis and Clark the comedians? For 43 years, they antagonized each other as a topnotch vaudeville team. Then, in 1961, after their sixth appearance on “The Ed Sullivan Show,” Lewis called it quits. Eleven years later, Clark still hasn’t forgiven him. He harbors his hurts in a rundown New York hotel (with seven locks on the door). In sweeps his nephew, Ben, who’s also his agent, to say he’s finally gotten Willie a gig: a reunion with his old partner, Al, for a TV show celebrating the history of comedy. 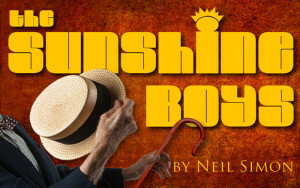 Poster for the Sunshine Boys at Scripps Ranch Theatre. You may recognize the duo by their common stage moniker: “The Sunshine Boys,” also the name of the marvelous 1972 creation of Neil Simon, which won the Tony Award for Best Play. Maybe you remember the 1975 film, with Walter Matthau and George Burns (who won a Best Supporting Actor Oscar). The play isn’t done that often, because it demands just the right pair for the parts. And Scripps Ranch Theatre has them, in Phil Johnson (as Willie Clark) and Eric Poppick (Al Lewis). With the rat-a-tat timing encouraged by ace director Ruff Yaeger, they play off each other perfectly, Johnson eternally explosive (if yelling a tad too much) and Poppick his dapper, soft-spoken but tightly-wrapped foil. Deftly balancing between them is the down-to-earth Ben (thoroughly credible Kevin Hafso-Koppman), whose uncle is giving him palpitations. And there are two nurses in the mix, splendidly played by Yolanda Franklin: a blonde bombshell and a no-nonsense caregiver who gives-as-good-as-she-gets from Willie. The funny lines fly fast and furious, though the New York accents slip a bit at times. The set (Andy Scrimger) is wonderfully dowdy and detailed, with a gorgeous view of the City skyline. The costumes (Mary Larson) are a terrific ton of ‘70s Throwback Thursdays, including leisure suits, and ties so wide they could cover a sofa. Overall, the production is one thoroughly enjoyable experience – about family and friendship; show business and aging; memory, regret and forgiveness. Simon remains the master of gut-busting one-liners, tinged with a touch of sadness.